Miriam’s life was pretty easy before it happened. Yes, she was a widowed mother, but nothing was strange about her life. She had an adorable daughter, a doting mother-in-law, no debts, and plenty of time to spend on whatever she wished. All that changed when Miriam began getting strange hang-up calls. Those hang-up calls turned into threats. Then, one day, she was followed and her life changed forever. Miriam learned the life she knew never really happened, and she knew nothing of the life she really had. How can she move past her false life? How will she navigate her real life? How will she deal with all these people demanding so much of her when she can barely find the motivation to continue existence? Follow Miriam’s journey as she goes from being a widowed mother to becoming the Rose of Petrichoria. Between being told her future husband will be decided through some competition, being kidnapped, and being shot, Miriam hasn’t had a moment to fully adjust to waking up 200 years in the future as a princess. Yes, life for her has become complicated, to say the least, and it doesn’t seem like it will be getting simpler anytime soon. The King’s Test will determine who will be Miriam’s husband and Arboria’s future King. In the Council’s haste to end a rebellion, they voted to allow Frank to participate in the King’s Test before knowing the full extent of his crimes against the Crown and Miriam, herself. Meanwhile, Miriam finds herself falling in love with the Prince of Southland, who has secrets of his own. Will Frank win Miriam’s hand and Arboria’s throne? Will Miriam get to marry the man she has fallen in love with or be doomed to a loveless marriage? Most importantly, will she ever remember her real life? Miriam has been told since she was thirteen that she wouldn’t marry for love. Unfortunately, that didn’t stop her from falling in love with Count Peter of Juniper. Now that she is actually facing her King’s Test, she fears he won’t win and she will have to wed the most qualified candidate, even if it isn’t Peter. When entire Noble families begin dying off from illnesses, everyone scrambles to figure out what is going on, how to stop the spread, and how to cure those who are infected. Feeling helpless in the situation, Miriam struggles with feeling inadequate for her future as Queen. With the help of Peter and her cousin, Ella, Miriam does all she can to help solve the problem infecting her people. What was Miriam like before she lost her memory? Who infected her with the mutated Daze? Where have all the Noble men of age gone? Unravel the events that led to Miriam being put into her freeze. All hope seems lost for Miriam. She’s married to Frank, who is taking over her kingdom by destroying it. Evergreen Palace is swarming with his army, and there is no one left on her side with whom she can communicate. She seems truly alone. Will she give in to the rest of Franks demands? Will someone come to her rescue? Will she be able to take back her kingdom? Learn Miriam’s fate and that of Petrichoria in this conclusion of the Rose of Petrichoria series. Having moved around from home to home her whole life, Faith Elvenwood doesn’t like to get attached. In fact, in her current school, she has managed to seep beautifully into obscurity, only ever needing to worry about her bully, Reese Grant. With only a little over a month left of her senior year, she thinks she’s in the clear. That is, until the school counselor decides Faith would be the best person to show around new student, and fellow senior, Colman Nightingale. So many things don’t make sense about this. Why would the counselor want a self-proclaimed loner to be the new kid’s introduction to not only the layout of the school, but the social aspect of it? What is this guy doing transferring so close to graduation? How does that even work? Despite trying her darndest to put him off, Cole insists on becoming her friend. Just when Faith decides that it might not be so bad to have a friend, he goes and makes up some grand story about her being the daughter of a fae lord. Yeah right. Now that Faith has been found by the fae of Concordia, her father is determined to make sure his will for her life comes to pass. Betrayed by Cole, who said he would let her choose, everyone involved is now stuck waiting to go before the High King. He will ultimately decide who she will bond with. Thorne or Cole. Everyday, she finds herself wishing she was just a normal human, hiding in the background and minding her own business. However, that is not the future that lays before her. The Lord of Spring, her father, decides it would be good for her to get to know the male he wants her with and sends her to spend the weeks leading up to the hearing to the Spring Court. Unhappily, and forced by parental magic, she goes along with this plan. Everyone is surprised by a decision the High King makes in regards to their case that leads to Faith spending an equitable amount of time with Cole in the Dark Court. Who will Faith end up with and how will it affect the fae around her? In an unprecedented move, Thorne has gone against the will of the High King by kidnapping Faith, attempting to kill her brother, and murdering the Lord of the Light Court. As a captive in Spring, Faith notices that Thorne and his father are not only undergoing changes in demeanor and behavior, but appearance, as well. Cole, Luke, and Reese struggle to find a way to break through the mysterious dome surrounding the Spring Court, so they can rescue Faith from Thorne. It is built from magic no one has ever seen before, impervious to even High fae magic. Besides those working with him, no one is aware of an evil being manipulating those who are weak to the temptations he provides. Great and terrible power use Faith’s dire circumstances to come out of hiding and attempt to bring all Concordians to their knees. Mary Mason begged her mother to homeschool her, but she got sent to Thalassa Boarding School anyway. Being the shyest among her cousins, she unsurprised to be sorted into the Turtle Wing. 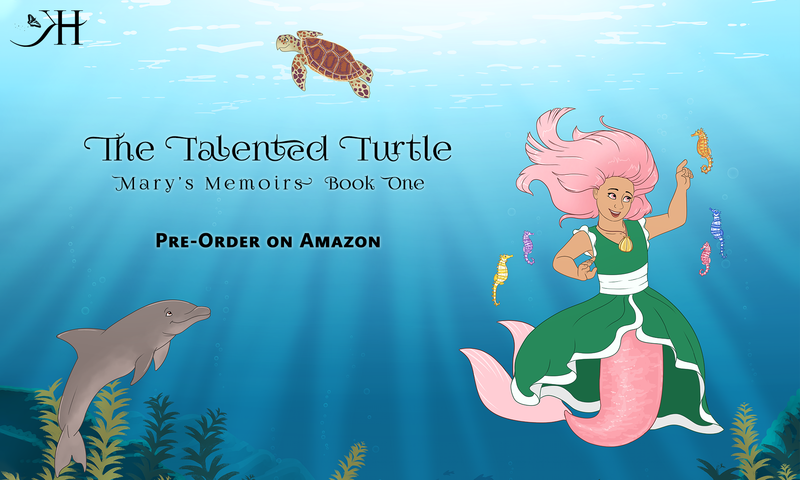 Even with them, she is still an outcast until two mergirls, Kona and Star, stand up to her when she is being bullied. When her teacher announces that all first year students have to perform in the annual talent show in a group of three, Mary is very nervous. Her only two friends aren’t in her class and no one else is interested in having her in their group. What will happen when she is forced to be in a group with her biggest tormentors? Can they get past their differences to put on an amazing performance or will they be humiliated? This is likely to be the only bedtime book I release. When I was pregnant with my daughter, I wrote her a lullaby called Little Cub. My husband loved it so much, he suggested I get an illustrator to draw some pictures and release it as a children’s book. Shortly after Mary was born, I went to Upwork (I think it was called something different back then), and hired a gal by the name of Shayne Hood to draw the images. Here I am, nearly 9 years later, getting ready to finally release the book. I am very excited to get this book out to the public so you can all enjoy this little song I wrote for my own little cub.